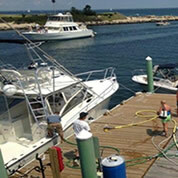 Oak Bluffs Marina has a new fuel dock facility located on the large floating dock next to the Harbormaster office. We can accommodate vessels up to 60 ft.
We sell both gas and diesel with the lowest prices in the area! The fuel dock monitors Ch. 71 and is open 7 days a week from May to November each season.